As soon as I saw this giveaway, all I could think of was my Montessori classroom. I have never been able to get away from the desire to stock my classroom, even though I am not currently in a school. But one of our favorite things was food prep both for individual snacks and for the whole class or any get-togethers we may have. And who couldn’t use more supplies? That being said, any of these things would also be great in the home kitchen, as well. Check out the goodies below. Go ahead and order some now and enter to win more for later. Share them with your friends. Or if you have a classroom, have a set for at home and a set for the classroom! Which ones do you want? Welcome to the Spring Fling Cooking Gadgets Giveaway! 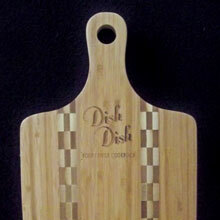 3 Winners Will Receive the Dish Dish Digital Recipe Album plus the Dish Dish Bamboo Cutting Board! The first place winner will also receive the Vidalia Chop Wizard! Enter Today & Good Luck! This giveaway is in no way endorsed, affiliated, or associated with Facebook, Twitter or any other Social Media Networking Site. This Giveaway is valid in the United States Only and Entrants must be 18+ years of age to enter. This giveaway event will end at 11:59 PM (EST) 3/31/17. The winner will have 48 hours to email their information back to mcushing7 at hotmail dot com or a new winner will be drawn, you may want to put this email address as safe as it could go to spam. The sponsors are responsible for shipping of the above prizes. No blog associated with this contest(s) are responsible for prize fulfillment. If you would like to be a sponsor in a giveaway like this please email Melissa Cushing at mcushing7 (at)hotmail(dot) com. If you take an entry you must stay following for the entire contest or you will be disqualified.